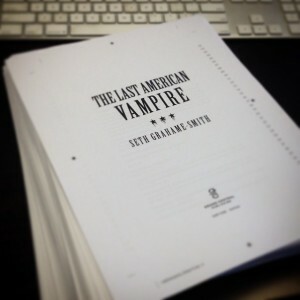 Seth Grahame-Smith has finished up work on his sequel to “Abraham Lincoln: Vampire Hunter,” the hit novel that spawn a feature film from Fox in 2012 directed by Timur Bekmambetov. The author and producer/screenwriter posted the pic you see here via social media. Proofing is complete and now it’s off to the printers for a January 13th release from Grand Central Publishing. In Reconstruction-era America, vampire Henry Sturges is searching for renewed purpose in the wake of his friend Abraham Lincoln’s shocking death. Seth Grahame-Smith ingeniously weaves vampire history through Russia’s October Revolution, the First and Second World Wars, and the JFK assassination. Expansive in scope and serious in execution, THE LAST AMERICAN VAMPIRE is sure to appeal to the passionate readers who made Abraham Lincoln: Vampire Hunter a runaway success.